Jack George had the distinction of being the only member of Collingwood’s “Machine Team” to live through to the new millennium. When the Collingwood, St Kilda and South Melbourne defender passed away on April 14, 2000, he was only six days short of his 90th birthday. The dashing defender and occasional follower could muster only seven games for the Magpies over two seasons, 1930 and ’31. The competition for spots in Collingwood’s defence, then considered one of the best in the game, was simply too intense. Ahead of George in his favoured position of full-back was the entrenched incumbent, Charlie Dibbs, with a teenager called Jack Regan coming through the ranks. It is no surprise, then, that George became much better known as a St Kilda defender. The Saints had been one of the clubs George had played against in the back pocket in one of his two games in 1930. Obviously they were impressed enough to recruit him in the middle of the 1931 season. The 178cm, 81kg backman began plying his football trade as a teenager with Brighton Vale seconds in the Federal competition. It was with this team that he first enjoyed the full-back’s role. Trying to better his football experience, George transferred to Williamstown in the VFA. But he was stymied by the selection committee, which only gave him a handful of senior games for the season. George carried on with good form in the VFA seconds, winning the club’s best and fairest and marginally missing out on the competition’s best player award. How George came to Victoria Park for the 1930 season is still a mystery. What is certain, though, is that he faced an almost insurmountable challenge to fight his way into the team. It was hardly a surprise the following season when it was reported that he had moved to St Kilda. George was obviously an optimistic man. How else can you explain his claim in the early 1930s that the Saints would carry off the Premiership, “if not this year, then next”? But even if his footballing prognostications weren’t too close to the mark, his prowess on the field ensured a growing reputation at the Saints. A talented runner whose fleetness of foot once saw him run third in the Stawell Gift, George showed the same sort of dash when he was clearing the ball from St Kilda’s defensive zone. One Saints observer said: his “brilliant and well judged dashes from the goal line … [and] when called upon to defend his goal with high marking Jack proved equal to the task, and held many fingertip marks”. In all he managed 55 games with the Saints. 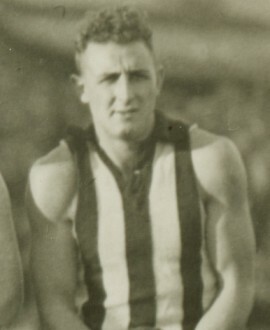 But newspapers reported that he turned up for pre-season training with the Saints ‘carrying too much weight’ in 1936, and he transferred to South Melbourne, where he played a further 11 games for an overall VFL tally of 73. There is no doubt he was good enough to have stayed at Collingwood, but there’s also little doubt he would have played fewer games. In the end, Collingwood gave him his start in what turned out to be a solid career at the top level.